Mordasius wrote: 1) I don't think you need Latitude and Longitude to show on the tooltips. The position on the map is enough to indicate the location. Not a bad idea, I have left it in there for testing purposes, but as time goes on and there is no problems, I can take it out. Mordasius wrote: 2) It may be time to think about a Border.png file updated every 24 hours along with UpdateDividers on some of the other Image Meters. Updating the graphics every second isn't necessary and may be a little CPU intensive although it is still miles away from anything you'd notice on any machine upgraded over the past five years or so. I see what you mean. The skin is trying to update around 50 things, so UpdateDivider is definitely going to be used in the future. My CPU usage stayed at about 1% for the Rainmeter process all while EarthquakeMap was running, but other machines could be affected much worse. The reason why I didn't use a Border.png is because I wanted to make it easy for anyone to select an appropriate size they wanted without having to change any image files. For instance, if you open "Variables.inc" (or click the middle button on your mouse anywhere on the map), you can set the image size you want without having to edit anything else. I kinda like it that way. Mordasius wrote: 3) I think the [Title] meter saying stuff like "Earthquakes in the Last 7 Days with Magnitude 2.5 or greater" has become superfluous and could be put on the tooltip for the earthquake icon. Honestly, I just might remove it altogether, since you select which "type" of feed to use. Plus it doesn't reflect the same time frame for the disasters, since I get that from another site. Mordasius wrote: 4) I don't think you need 'Drought' on a map like this as drought is something that builds up over a period of time rather than being a recent, largely unexpected, event like the others. I just translated every "event" from their feed, only taking out the earthquake "events". Mordasius wrote: Also what is a 'Marine' event and is there a need to differentiate between Storms and High Wind events? I do not know what a "Marine" event is. I guess we will find out together when one happens. "Storms" are different than "High Winds". For instance about a month and half ago, my area was hit with some really strong Santa Ana winds that did a lot of damage, yet no storm was associated. Just change the NUMBER of the event you don't like to 1. Again, since there hasn't been every type of "event", not all have been tested. I am sure the one word events (like "CYCLONE" or "TSUNAMI") will be correct in the line above - HOWEVER, I am not sure if the two-word "events" from the feed will be correct (like HIGH_WIND or HIGHWIND or HIGH WIND). These changes will be made when they show up. Last edited by JamesAC on January 10th, 2012, 7:06 pm, edited 1 time in total. Just noticed that "Tsumani" works.....but the earthquake shows on top of it. 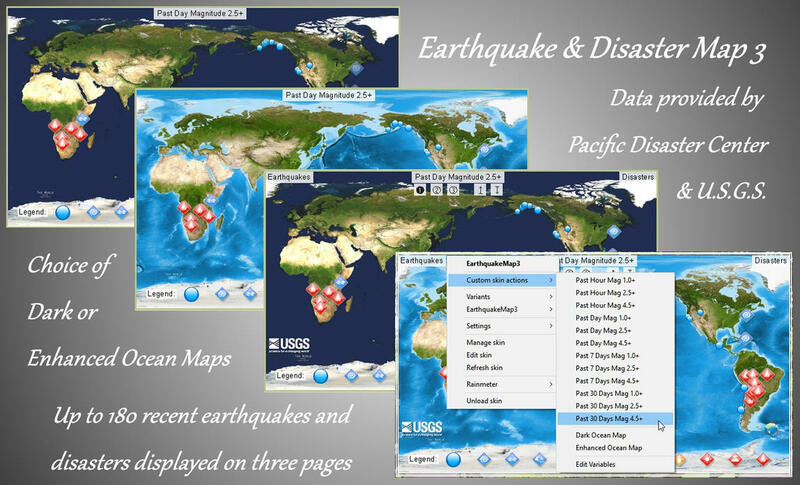 I could display the "events" on top of all earthquakes, but I would rather have the earthquakes on top. I'm sure with a lot of complicated math, I could make the events and earthquakes display from "oldest" to "newest", but I don't think I want to get into that right now. Also, the tooltip gets a little messed up when the mouse is over it since both containers on located in the same position. Ok, I added UpdateDivider to the appropriate places making the skin use less resources. I confirmed that "HIGHSURF" is correct from the feed, so I going to assume "MANMADE and "HIGHWIND" work as well. I also changed where the "Legend" and "Last Updated" are located making it easier on the eyes. Here is Version 2.2 - Enjoy! In all frankness your idea is incredibly good and I did not think to find, one day, a project that works with all this information. I thought at first you were working only with Rsoe Edis but I was pleasantly surprised; I really hope you will be able to release a version 2.3 because on my side there seems to be some problems concerning the sources I really wish you courage for this idea is really great ! Clean up tool tips info on top row of actions. Corrected typo that prevented character reference from working with beta r2876... Geez! Last edited by eclectic-tech on January 6th, 2018, 3:35 pm, edited 3 times in total. Oh my...has it been that long? Honestly, I am surprised it worked up until recently. Yes, your code still worked for the most part (even after 5 years!). I had to re-arrange the @includes to get the items "above" the map. But then I saw how much info was available from those feeds, and decided to see if it could be expanded. StringIndex2 to the rescue! Glad you like the changes... I may add links to the sources and a few other changes, then perhaps release it on my DA site. It's a great idea you had, I just updated it a bit! Nice skin, although I'd love to have an option to make the map smaller. Matth wrote: Nice skin, although I'd love to have an option to make the map smaller. You may see some overlapping of the legend icons or labels, but this will not affect the functionality.